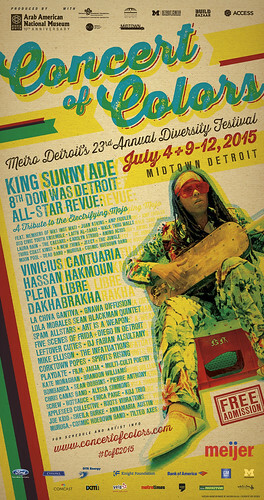 Regular readers of Midwest Guest know that Detroit's annual Concert of Colors, a multi-day festival of expressing unity and diversity through an eclectic bill of world music and some of the Detroit area's finest new and vintage music is one of our favorite events of the summer. This year, the festival's 23rd annual outing promises to be every bit as entertaining and inspiring as ever, judging from the schedule of events and impressive variety of music on tap for festival goers. Enjoy a few favorite images that Tim and I made during previous Concert of Colors years, while I give you a quick taste of this year's Concert of Colors schedule. The festival's celebration starts with a "Tune Up" concert on Saturday, July 4 at Detroit's New Center Park hosted by DJ Ismael from Public Radio's WDET This Island Earth Show. Groove to the Latin funk of Spam Allstars during the 9 p.m. concert as an appetizer for the rest of the festival, which happens the next weekend. Wednesday, July 8 brings an opportunity to celebrate the tenth anniversary of the Arab American National Museum, attend an interactive Forum on Community, Culture and Race and enjoy a community-style Iftar dinner modeled after traditional Ramadan observances of breaking fast together at the museum in Dearborn. The program starts at 7 p.m., RSVP required. 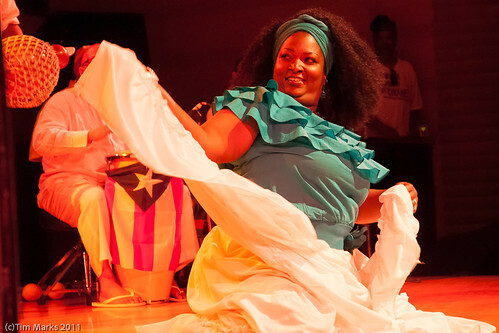 Thursday, July 9 brings another opportunity to celebrate an anniversary as the festival heads to the Charles H. Wright Museum of African American History to help celebrate its golden anniversary with a program of hip hop and more hosted by Mike Ellison and a cast of talented friends in the museum's main theater at 8 p.m. And don't miss a menu of multicultural-multigenerational poetry readings in the museum's multi-media room starting at 6:30 p.m.
Friday, July 10 the Concert of Colors festival heads to the Detroit Institute of Arts, which also celebrates, you guessed it, an anniversary this year! The DIA celebrates its 130th anniversary and the varied bill of fare at the festival this evening includes the pop/jazz of Leftover Cuties, a multi-media presentation as a tribute to the art of Diego Rivera and Frida Kahlo to close out the DIA's blockbuster exhibit dedicated to those two artists and a showing of the film, Jauja, starring Viggo Mortensen (in Danish with English subtitles). Programs start at 4 p.m. The Concert of Colors kicks into high gear with its penultimate day, moving to Max M. Fisher Music Center (home to the Detroit Symphony Orchestra) on Saturday, July 11. The action starts at 1 p.m. with crafts, children's activities, food trucks and unique vendors on hand as music lovers can check out some great music across the venue's three stages. Enjoy the Ukrainian music of DahkaBrakha, followed by Moroccan music from sintir (a three-stringed lute) master Hassan Hakmoun and King Sunny Ade's Nigerian juju music on the Main Stage. The Diversity Stage, fronted by a dance floor, hosts acts that include techno from DJ Alsultany and the Celtic Rock of the Corktown Popes (we loved seeing this act at a previous Concert of Colors). The Wolverine Outdoor Stage hosts a really eclectic bill that includes funk, Puerto Rican folk, acoustic blues, R&B/jazz and more. 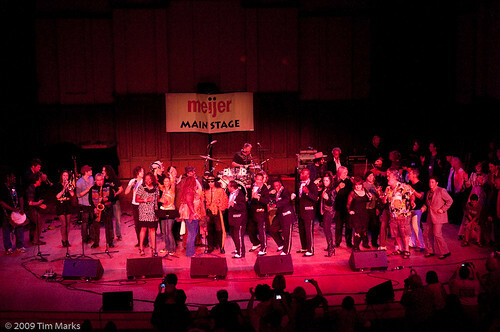 Sunday, July 12 marks the return of what is always our favorite part of the festival: The Don Was Detroit All-Star Revue, a collection of performances from Detroit artists. 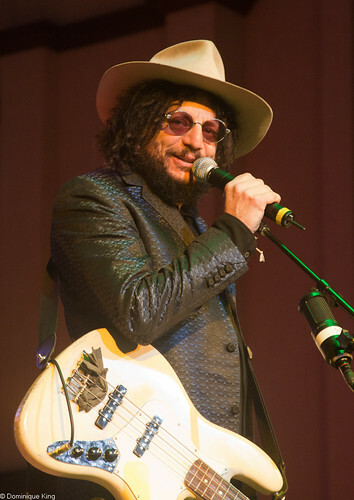 This year, the Revue honors the legendary radio disc jockey, The Electrifying Mojo, whose radio shows during the late 1970s and early 1980s brought listeners a stew of tasty musical treats that brought together funk, rock and electronic music in a way that greatly influenced the development of the techno music that gained fame in Detroit. The Revue starts at 8 p.m. on the Main Stage. 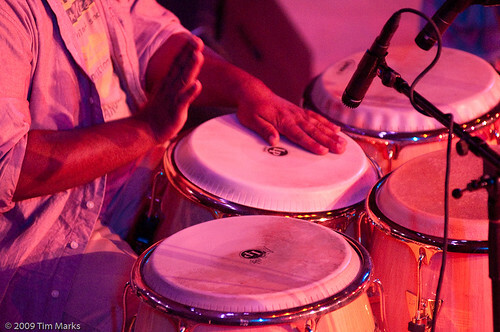 Other Main Stage acts this night include Plena Libre with a bill of Puerto Rican Plena and Bomba music and Bossa Nova music from Vinicius Cantuaria. 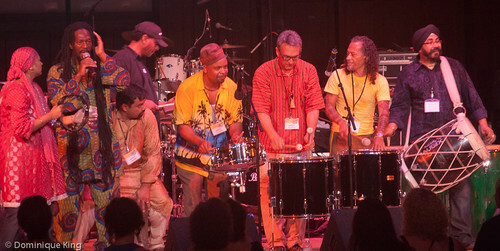 The Diversity Stage hosts a bill that includes Playdate, an imaginative kids' music program with Paula Messner and Maggie McCabe, and Latin Fusion from LaChiva Gantriva, which started as several Columbian students paying percussion instruments together before picking up more musician friends to create a unique Afrobeat, rock, funk, rap and jazz influenced sound. Sunday's program on the Wolverine Outdoor Stage includes blues, folk, R&B, jazz and pop performances. Sunday's schedule, like Saturday's, begins at 1 p.m. Check out the Concert of Colors Web site for more details about the Concert of Colors schedule and artists. The Concert of Colors is about music, but at its heart, it is a celebration of the diversity of cultures and people of southeast Michigan. Best of all, this great multi-day festival of performance and celebration is absolutely FREE! Food is often one of the ways people encounter new cultures, and you can learn a lot about a culture by learning how its people prepare, serve and consume meals. This is the core idea behind the Arab American National Museum (AANM) Yalla Eat! 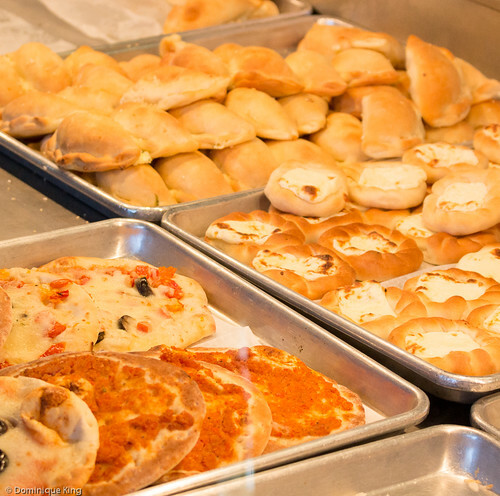 program, which is an immersive foodie adventure spotlighting southeastern Michigan's Arabic American population though their groceries, bakeries, restaurants and other food-related businesses. We loved experiencing the Yalla Eat! tour of food-related spots along Dearborn, Michigan's Warren Avenue last fall, and I'm glad to see the museum sponsoring another group of Yalla Eat! programs this spring by exploring the Arab American food scene on walking tours of Detroit's venerable Eastern Market. 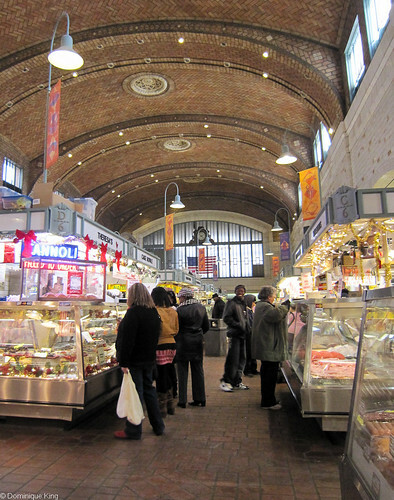 Arab Americans began establishing themselves and their food-related businesses during the earliest days of Eastern Market, which, at 160-plus years old, is the largest historic public market district in the country. The Yalla Eat! tours are just one of the innovative ways the AANM employs to expand how it tells the story of Arab American culture, interacting and engaging with the greater Detroit community beyond the walls of the museum as the museum celebrates its tenth anniversary. 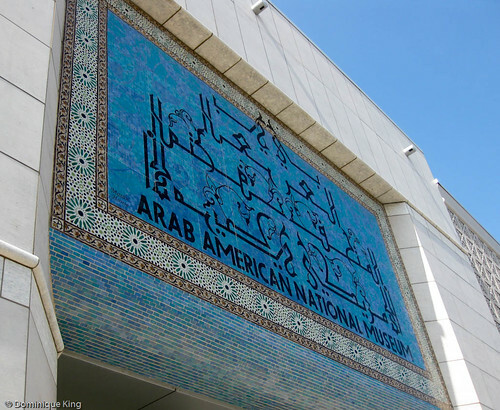 In 2005, the AANM became the first museum devoted to sharing the story of Arab Americans, through their history, art and culture, and it still is the only one of the 17,500 museums in the United States to focus on Arab Americans. The Smithsonian Institution acknowledged the museum's unique status by making the AANM a Smithsonian Affiliate (one of only 200 in the nation), with Smithsonian officials noting the AANM sets a model for community-oriented thinking and programming. 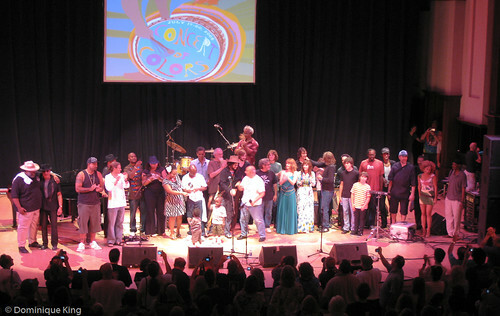 The museum's strong involvement with Detroit's annual Concert of Colors, a diversity and world music festival, is another example of AANM's community-oriented thinking that goes well beyond museum walls to interact and engage with the greater southeastern Michigan community. Don Was, musician and uber record producer, returns to his hometown of Detroit every year to organize a show for the Concert of Colors because he views the event as one of the best ways of encouraging and spotlighting the city's unique spirit of unity and perseverance in the face of adversity. Was further noted in an interview with me that the event "uses music as a metaphor for society" where "the whole is more than the sum of its parts." The AANM celebrates its milestone tenth anniversary this month with a series of events that include perennial favorites like Yalla Eat! and the Concert of Colors as well as newer projects like traveling exhibits showing in Los Angeles and Washington D.C., continued cultural and artistic events in the museum's new annex and a new display due on December 4 dedicated to St. Jude Children's Research Hospital and its founder Danny Thomas, a Detroit native and a beloved Lebanese-American comedian and radio and television star from the 1940s through the 1980s. Yalla Eat! 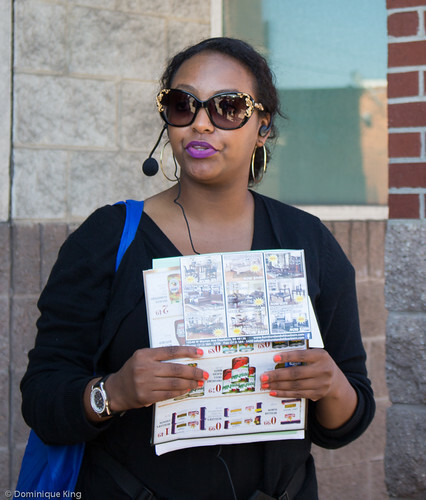 tours of Eastern Market happen at 1 p.m. on Tuesdays and 10 a.m. on Saturdays from May 30 through June 13 this spring. Cost is $20 per person and $15 for AANM members. Ticket prices include a Yalla Eat! tote bag, map, food samples and a ticket for free admission to the AANM. Trust me, you will not go away from this tour hungry! The 23rd annual Concert of Colors happens in July. Check the Concert of Colors site for further details as they become available. Check the AANM Web site for a schedule of events that include multicultural performances series, film festivals, book signings, conferences, lectures, art exhibits, craft classes and more. When the folks at the Arab American National Museum (AANM) said, "Yalla eat!" (Arabic for "Let's go eat! "), I immediately signed us up to join them on a culinary walking tour of East Dearborn, a Detroit community that is a hub of Arab-American culture in Michigan and home to one of the largest concentrations of Arab-Americans in the country. Food can be one of the best ways to explore an area's culture, and it was a special treat for us to find a program like this offered so close to home. Isra El-beshir, Curator of Education & Public Programming for the AANM, told us that food is often the first exposure to a different culture for many folks before leading us on the tour. This metro Detroit neighborhood saw its beginnings as an Arab-American enclave during the 1920s when workers immigrated here for jobs at the Ford Motor Company's nearby Rouge Factory Complex. Changes in East Dearborn over the years reflect a century of Arab-American and Middle Eastern immigration to the neighborhood and, especially, the revitalization and commercial development of the area starting in the early 1980s. El-beshir told us that about half of the 200 businesses currently in the neighborhood are food-related, giving us an incredible opportunity to sample many tasty experiences in a single afternoon. Plentiful Arabic restaurants, food stores and other specialty service and commercial businesses draw Arabs from around the region, as well as fans of intriguing culinary experiences and the Middle Eastern cuisine with its emphasis on vegetarian dishes, grilled meats and spices like cumin, cardamom, nutmeg and turmeric. Tim and I met El-beshir at the Super Greenland Market on Warren Avenue at Miller Rd. along with about a half-dozen other foodies anxious to begin our culinary adventure. Founded in 1993, Greenland claims to be the largest Arab grocery store in the country and boasts five locations in Dearborn and Dearborn Heights. We toured the bulk grain, dairy, produce, and deli sections to see many of the store's specialty imported foods, as well as an amazing display of locally sourced produce and prepared foods. One of the store's butchers met with us to briefly describe the preparation procedures for the store's Halal-certified meats and told that this location prepares as many as 14-17 cows each week according to Halal requirements. We tasted a few of Greenland's in-house prepared foods like Kubba Fries, a vegetarian kibbeh made with tomato and bulgar, halva (a wheat-based treat that tasted like chocolate) and hoummos with pita bread. Check out Super Greenland Market's Web site or Facebook page for more information. Our next stop Hashem's Nuts and Coffee Gallery, a business started by Abu Ali Sheik Theeb in 1959 at the village of Bint J Bail in southern Lebanon. 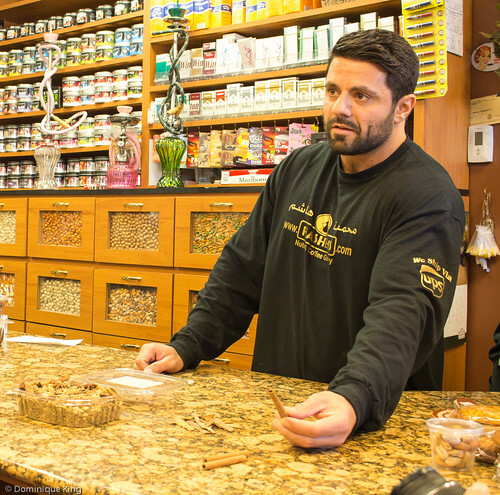 The founder's grandsons now offer specialties like freshly roasted nuts, finely-ground Turkish coffee, sweets and Middle Eastern spice mixes at their Dearborn store. We also got a short tutorial on the preparation of Turkish-style coffee, which struck me as a perfect recipe for staying awake 24/7/365! Explore Hashem's Web site and Facebook page for mail-order offerings, the Turkish coffee tutorial and recipes. 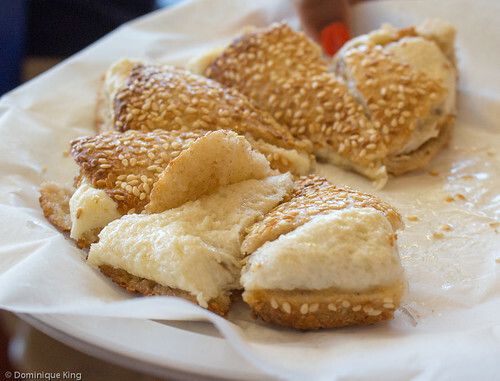 We stopped at LaBon Sweets where brothers Samir and Mohammad Majed perfected a recipe for the kanafa sandwich, a popular Arab sweet consisting of sweet fried cheese on a sesame seed bun, which they recommend for breakfast, lunch, dinner, snacks or dessert. The store opened in 2005 and has a second store in Dearborn Heights. Check out LeBon Sweets' Web site for mail order info. We made a quick stop at the Gift Warehouse to check out kitchen and serving ware that included tiny cups for Turkish coffee and, my favorite, a good supply of evil eye amulets that many people use to ward off evil looks or curses. Next stop was the New Yasmeen Bakery for samples of their large thin pita breads and a cheese-topped pita snack from their huge in-store prepared foods case. Check out the New Yasmeen Web site for information about online ordering. Shatila, a bakery founded in 1979 by Riad Shatila, had some beautiful French-style pastries and Middle Easter sweets, but the real hit here for us was Shatila's house-made ice cream. Shatila's 11 ice cream flavors include the highly recommended pistachio, as well as more unusual flavors like kashta (with rosewater as one of its ingredients). We returned to the store after the tour to buy some pineapple and lemon ice cream to take home with us! The fruit-flavored ice creams were not sorbet-type concoctions as you might expect, but had a nice creamy texture and taste. Visit Shatila in Dearborn or West Bloomfield, Michigan, or visit the Shatila Web site or Facebook page. Our last stop was the Al-Ameer Restaurant, a place which scored a visit from celebrity foodie Tony Bordain a few years ago. Established in 1989 by Khalil Ammar and Saki Hashem, the restaurant strives to provide an authentic ethnic experience featuring a menu of Mediterranean food made with locally sourced produce and Halal-certified meats in a family-friendly atmosphere. We digested our tour experience as we shared plates of beef and chicken shawarma and the restaurant's fresh-baked pita bread with our tour mates. Want more information about culinary adventures featuring Arabic and Middle Eastern cuisine? Check out the Visit Detroit Web site for links to other restaurants, recipes and suggestions for day trips around the Detroit area. Also keep an eye on events listings at the Arab American National Museum over the next year as it plans to add more food-related programs and events during the run-up to its 10th anniversary in 2015. Want to try creating your own Middle Eastern culinary experience? Check out The Complete Middle Eastern Cookbook by Tess Mallos. I found that a lot of spellings for food items and ingredients varied from source to source, so I opted for using the spelling used by the specific business I was referring to at the time. Kibbeh? Kubba? Kibbee? Hoummos? Hummus? If anyone has a more definitive answer about the English versions of these terms, feel free to let me know! Thanks to the Arab American National Museum for hosting us on this tour. 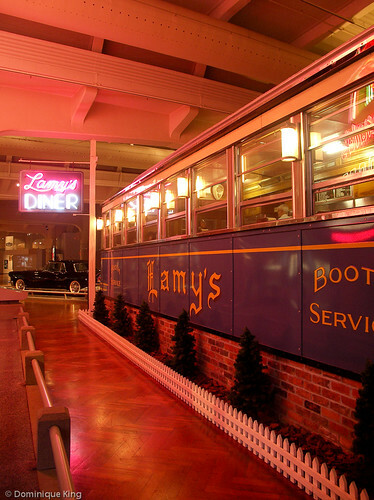 Comfort food like macaroni and cheese, chicken and waffles, and Sanders Hot Fudge cream puffs were on the menu when we visited The Henry Ford in Dearborn, Michigan recently for the museum's Local Roots Winter dinner. We loved sampling the menu of Michigan favorites as we strolled around the museum on a cold February evening, but I especially enjoyed the fact that the dinner was tasty evidence of the museum's continuing commitment for supporting local farmers and food producers. We started our evening with a cup of chili chosen from a table featuring several different kinds of chili and toppings. I opted for a white chicken chili, while Tim went with a more traditional ground beef chili, both accompanied by a corn bread muffin. We chose chicken and waffles, dressed with a Michigan Maple and Mustard sauce as our next course, and the chef attending the table told us that the dish is a popular appetizer choice for banquets at the museum. The sauce was a nice mixture of sweet and spicy, as opposed the plain maple syrup as I've seen served with chicken and waffles elsewhere. Our next stop was the station featuring two kinds of meatloaf carved to order beneath the museum's giant '49 Ford billboard. I chose turkey meatloaf, while Tim had the more traditional beef variety. We especially enjoyed the accompaniments of Guernsey Buttermilk mashed potatoes and Vernors-glazed heirloom carrots at this stop (we buy local Guernsey-brand milk at our grocery store and Vernors Ginger Ale is another favorite I always have on hand at home). It was a good thing we had plenty of time for walking around the museum as it helped us walk off at least a few calories before we headed on the next two courses! I'm a big mac 'n' cheese fan, so you can imagine that the station featuring two different varieties of mac 'n' cheese along with ham and greens was a must-do for both of us. 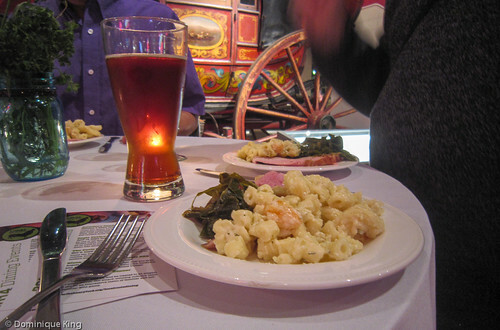 We sampled both varieties of mac 'n' cheese offered, which included Michigan Shrimp and dill havarti dish and a variety featuring smoky cheddar cheese from Detroit's Traffic Jam restaurant (which also produces its own cheese, ice cream and beer, among other items). 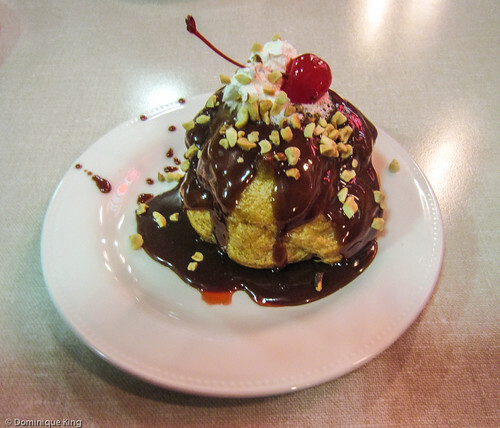 Our last stop was at the museum's vintage-1946 Lamy's diner, where we each had a cream puff with ice cream and Sanders Hot Fudge sauce as we snagged a seat in one of the diner's booths. The Local Roots Winter dinner is one of five such events scheduled for 2014 to showcase the museum's local menu items. The Henry Ford established the Local Roots initiative in 2006, increasing its local sourcing and staging events to showcase their involvement with local farmers and food producers in subsequent years. We're frequent visitors to The Henry Ford, and we've noticed the steadily increased use of Michigan ingredients in restaurants and snack counters at The Henry Ford and its outdoor living history museum, Greenfield Village, in recent years. The Henry Ford's also expresses its emphasis on local foods and commitment to locally sourced product at the museum's special events throughout the year, on the schedule of educational classes and in the food products that appear on the shelves of shops at The Henry Ford. Jesse Eisenhuth, director of food service and catering at The Henry Ford, takes special pride in the Local Roots program. Basing the entire food and beverage operation on local sourcing at The Henry Ford has several benefits, according to Eisenhuth. Local sourcing supports the local economy at large and creates jobs as it supports local farmers, food producers, and distributors of Michigan products. "Whenever possible, we make a committed effort to purchase good from local farmers or producers located within 200 miles of our campus, or at the very least, the State of Michigan at large," said Eisenhuth via email. 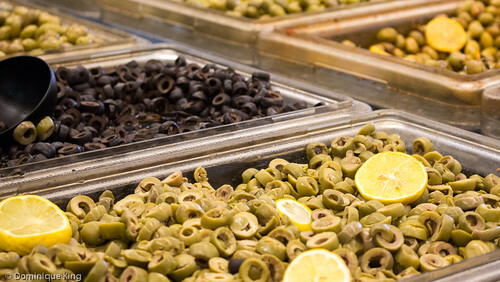 Using local sources helps ensure the purchase of healthier and fresher food for museum guests, as well as reducing the environmental impact of transporting the food to the museum. Be sure to look for the Local Roots logo on menus when you stop for a meal at The Henry Ford to make sure you try some of southeastern Michigan's best and freshest food. Check out this list of local food sources working with The Henry Ford. 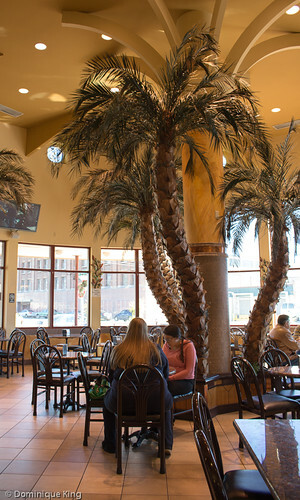 There are lots of favorites that we regularly buy when shopping or eating around the Detroit area that include: Dearborn Sausage, Bettermade chips, Detroit Popcorn, Garden Fresh Salsa, Faygo, Founders Brewing Co. Guernsey Dairy, Motor City Brewing Works, Zingerman's and Detroit Eastern Market. It also pleases me to find that The Henry Ford works with Forgotten Harvest, a great metro Detroit hunger and food rescue organization. Upcoming Local Roots dinners at The Henry Ford include: a preview of this season's menu at the Eagle Tavern in Greenfield Village (April 14); The Paris Influence on Michigan cuisine at Eagle Tavern (May 2); a backyard-style BBQ and blues meal at the Greenfield Village Pavilion featuring the Front Street Blues Band (August 8); and Elegant Game Dinner at the museum's Lovett Hall (November 7). Tickets cost $68 and include dinner plus two drink tickets and access to a full cash bar. 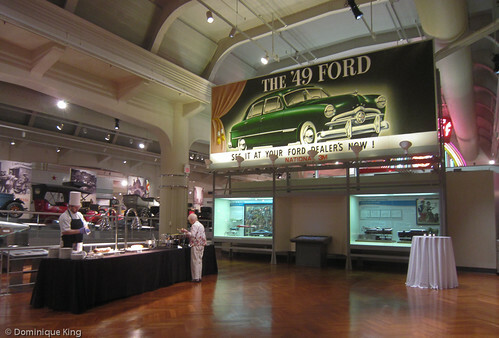 Thanks to The Henry Ford for hosting us at this dinner for review, with no further compensation. What to do in the Detroit area when the weather gets cold and snowy and you're yearning for a nice walk? One great solution to that dilemma for us, especially when the temperatures dip below zero and the wind chill dives to unmentionable sub-zero readings as it's doing here this month is to relieve a bit of our cabin fever by talking a stroll through history at The Henry Ford in Dearborn, Michigan. Regular readers at Midwest Guest know that we have memberships at The Henry Ford and we often enjoy visiting to photographing its outdoor living history facility, Greenfield Village. We also enjoy checking out the cool artifacts in the warm environs of the indoor museum, making full year-round use of our museum memberships. 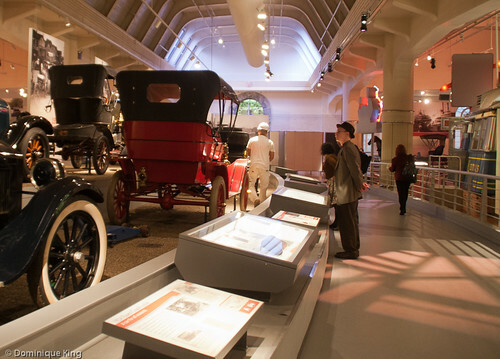 Driving America-It should come as no surprise that automobiles play a starring role at a museum named after one of America's best known automotive pioneers. Gear heads will find plenty to admire at The Henry Ford. "Driving America" covers 80,000 square feet of space in the museum with 130 vehicles, more than 60 showcases of automotive-related artifacts and a 100-seat "drive in" theater that plays films, as well as hosting special theatrical events or musical performances. The museum closed most of their automotive exhibit for nearly a year before re-opening a re-imagined version of the exhibit in early 2012 that featured museum goers' favorite cars and roadside artifacts, as well as many new interactive features designed to encourage guests to delve deeper into the history of America's love affair with cars and their impact on American popular culture and everyday life. Rosa Parks bus-The Henry Ford commemorates February as Black History month in a big way each year with events and special exhibits, but one of the most prized artifacts it proudly displays year-round is the Montgomery, Alabama city bus that Rosa Parks rode into history after refusing to relinquish her seat to a white man in December of 1955. The bus sat, sadly neglected in an open field, for several decades before The Henry Ford acquired it to loving restore and display at the museum. 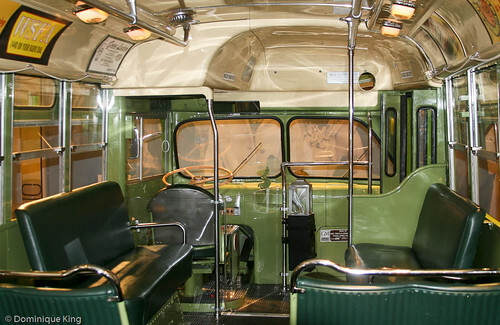 Museum visitors can board the restored bus and sit in the place that Parks refused to vacate in 1955. 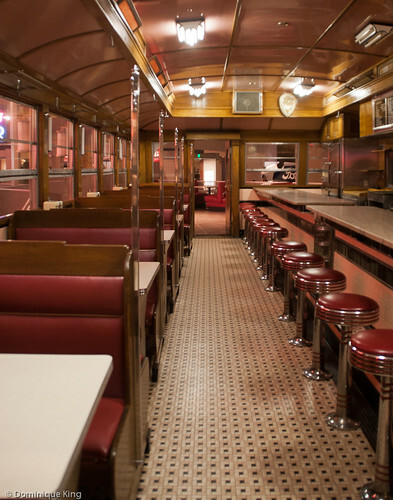 Lamy's Diner-Experience a meal in a 40-seat 1940s-era roadside diner. I loved this artifact when the museum first included it in its exhibit about the car and how it affected American culture, but I was overjoyed when the museum reworked the classic roadside diner to allow visitors to enjoy a quick meal. We love stopping to sit at the counter and ordering retro favorites like a sandwich and a quintessential Detroit beverage like Faygo Rock & Rye. McDonalds sign-This 1960s McDonalds 26-foot-tall sign is one of my favorite pieces in the museum because of the personal attachment I feel to it. 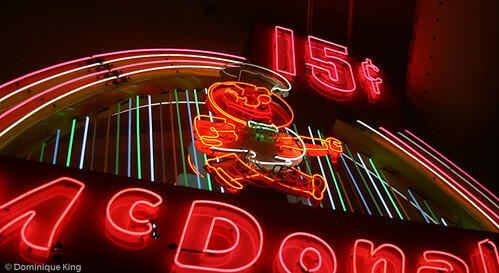 This particular sign stood at its original location on John R in Madison Heights long after many of the chain's locations replaced the neon version of this sign with more modern versions of their famed "Golden Arches". I loved driving by this sign featuring McDonalds' original Speedee logo for many years on my way to work, so I was happy to see it find a new home in the museum when McDonalds finally replaced it at the restaurant with a more modern sign. 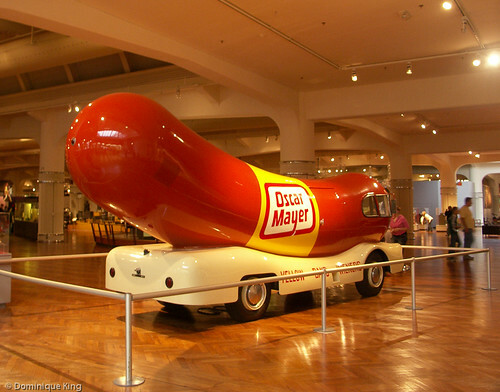 Wienermobile-This 1952 vehicle is reportedly one of the museum's most photographed artifacts and often draws a crowd of kids on their way to the museum's Wienermobile Cafe where they can grab a quick hot dog or other snack. The modern versions of the famed hot-dog-shaped vehicle are larger and plusher, but I like this classic version of the Wienermobile just fine. Made in America-This exhibit has some cool machinery, engines and other manufacturing artifacts highlighting the work of American innovators and inventors from the 18th to 20th centuries whose work powered the country's development through the Industrial Age. 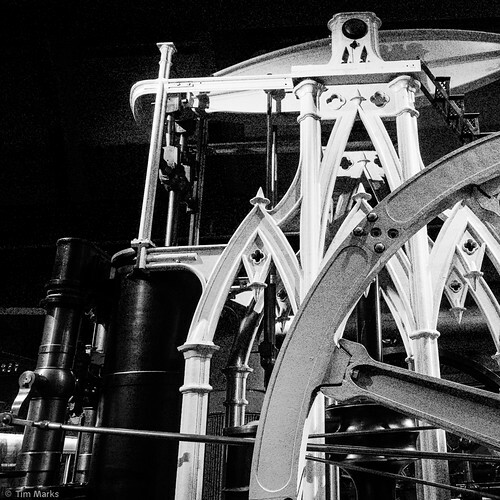 Tim and I both appreciated this mid-nineteenth century steam engine's Gothic design. You can see echoes in Tim's photo of the Gothic-style arches that I remember seeing in ornate churches and other buildings of that time period, although the beautiful lines of this steam engine spent much of its lifetime hidden inside of a lead processing factory in Philadelphia, Pennsylvania. 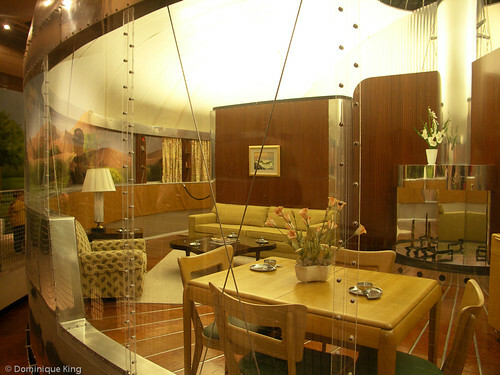 Dymaxion House- I love the circular and streamlined architecture of this cool home designed by R. Buckminster Fuller, who was an architect, author, inventor and more. This home is a 1946 prototype of a Fuller design for an aluminum house. The two-bedroom home is about 1,100-square-feet with a design meant for easy shipping of the light-weight aluminum parts and easy assembly. The Henry Ford acquired the home in 1991, taking ten years to restore its 3,000 component parts and reassemble the structure before opening it to the public in 2001. We've also enjoyed many of the temporary exhibits at The Henry Ford in recent years, including: Lego Architecture: Towering American Ambition that included Lego models of some cool Midwestern landmarks; Rock Stars' Cars & Guitars 2; and a special showing of the Emancipation Proclamation that drew 21,105 visitors to the museum for a 36-hour vigil showing of the famed document several years ago. I'm looking forward to the "Women Who Rock: Vision, Passion, Power" exhibit coming to The Henry Ford in May, 2014. I've seen some of the 250 items featured in this show at Cleveland's Rock & Roll Hall of Fame + Museum in the past, but this looks like a fun show with a leather jacket from Joan Jett, a bustier from Madonna, a Fender guitar from the Pretenders' Chrissie Hynde, and Lady Gaga's infamous meat dress, which I've yet to see! 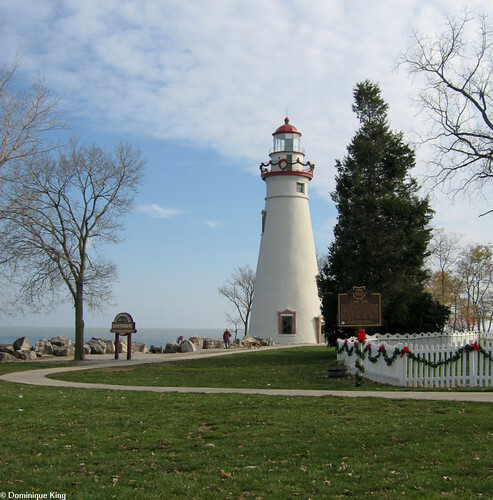 This post is part of the inaugural Best of the Midwest blog hop. Have a post that fits this month's theme? Join in the fun below! Regular Midwest Guest readers know how much I love covering Detroit's Concert of Colors each summer. 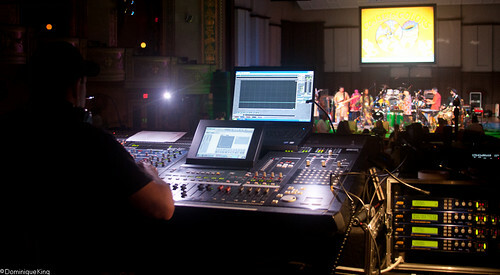 The four-day world music fest is a great catalyst for hope and unity in the D, so it's especially gratifying to see organizers offer a mid-winter bill of concerts, billed as a "sister" series to the Concert of Colors, that echoes the summer festival's bright spirit by bringing together people to explore and enjoy the talents of various cultures. Launched as a multicultural performance series in 2005, the Global Fridays series presents a diverse menu of some of the best in world and traditional music right here in metro Detroit at the Arab American National Museum (AANM) in Dearborn, Michigan. Start your virtual globe-trotting adventure on February 8 when the museum hosts Canzoniere Grecanico Salentino. Italy's top world music group performs here as part of an 11-city concert tour of the U.S. and Canada. Formed in 1975, the seven-member band and dancer travel the world honoring and re-inventing the music and dance traditions of Southern Italy's Pizzica folk dance and music. This will be the group's first visit to Michigan. March 22 brings finger-style acoustic guitarist Glenn Jones to the museum for his first area show in five years. The Boston-based Jones began his musical journey with the guitar after hearing Jimi Hendrix' second album at the age of 14 in 1967. Blown away by the guitar playing of Hendrix, he pleaded with his father to buy him a guitar. Dad bought the guitar, and Jones grew into an acoustic guitar player who developed his own unique style by building upon the expressive "American Primitive" styles of earlier steel-string guitarists and developing his own spin on it. Lac La Belle, an acoustic duo from Detroit, joins Jones for the March 22 concert. Jennie Knaggs (accordion/mandolin/ukulele/guitar/vocals) and Nick Schillace (banjo/mandolin/resonator guitar/vocals), who is also a leader in the American Primitive Guitar movement, re-imagine traditional music from the earliest days of recorded American country and folk music to reflect their own Rust Belt aesthetic and stories of their hometown, Detroit. Upright bass player, Serge Van Der Doo joins Knaggs and Schillace for this performance. Syrian-born Boshra Al Saadi arrives on April 5 for a performance that defies any real genre boundaries. Saadi grew up in Pennsylvania and came of age in New York City. Her influences include musicians like Brian Eno, post-punk music, Afro-disco, tribal beats and Arab folk dance music. Saadi's band includes bassist Mike Dossantos, drummer Mike Duncan, keyboardist/vocalist Joanna Choy and Natalia Perlaza, who plays the dumbeck (goblet-shaped drum). The Global Fridays season wraps up on May 10 with a performance by the Chicago-based Funkadesi, a multi-cultural group who won five Chicago Music Awards, including two for Most Outstanding Band. They also have a fan in the While House with President Barack Obama, who, as a then-U.S. Senator, expressed his appreciation for the band's energizing music. 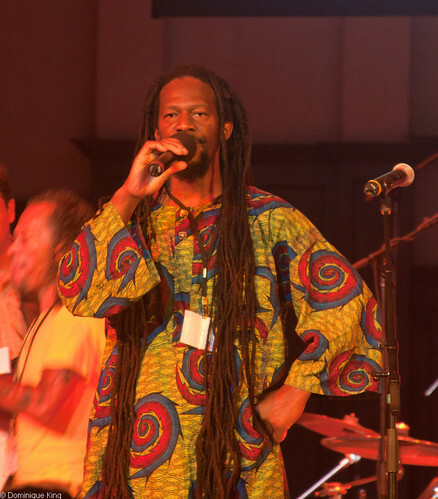 We experienced Funkadesi's music when the band dished up a hot set of music, fusing elements of the band's various cultural and ethnic traditions into a one-world vision and sound when Funkadesi was a last-minute add to the Concert of Colors schedule in 2011. Global Friday concerts begin at 7:30 p.m. in the AANM's 156-seat auditorium, which is on the lower level of the museum at 13624 Michigan Avenue in Dearborn, Michigan. Free parking is available in the lighted lot behind the museum. Tickets for each Global Fridays concert are $10 ($9 for museum members). Purchase tickets at the door, or order in advance at the museum's Web site. Want to check out some of the artists' music in advance? Here are links to some of the latest tunes from Canzoniere Grecanico Salentino, Glenn Jones, Lac La Belle, Saadi and Funkadesi on Amazon. Also, if you haven't visited the Arab American Museum, make sure you check it out. The museum's interior is definitely a must-see with its light-filled three-story atrium and architectural details like ornately decorated display cases and intricately tiled walls. 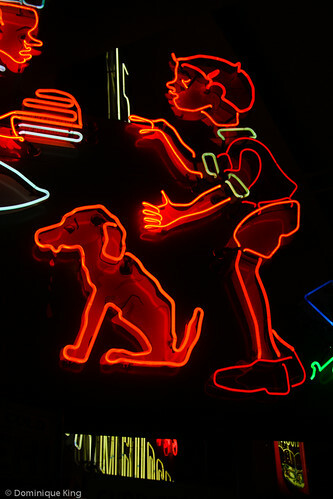 Museum hours are 10 a.m. until 6 p.m. Wednesday through Saturday and noon until 5 p.m. on Sunday. Admission is $8 for adults, $4 for students, seniors and children ages 6-12, free for children ages 5 and under and for AANM members. I loved my Lego blocks when I was a kid. Sometimes I think my simple sets of blocks, with a little window, sign or corner block thrown into the mix, required a bit more imagination than the ornate sets available these days that replicate landmark buildings. I can't deny that seeing some of the larger buildings constructed of Legos makes for a pretty impressive sight, though. 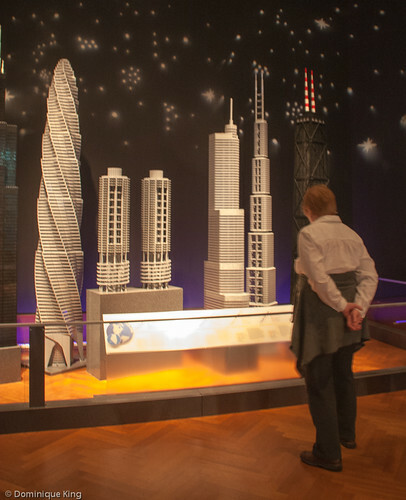 We recently visited The Henry Ford in Dearborn, Michigan to see the museum's Lego Architecture: Towering Ambition exhibit, and they had some great examples of Lego buildings that included some well known Midwestern landmarks. 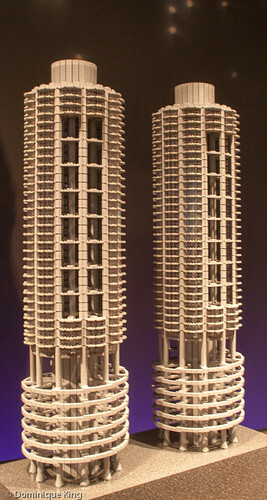 Here's a closer view of the exhibit's version of the famous "corn cob" buildings in Chicago. It's kind of fun to compare the Lego version with a photo of the real thing, which I took when we did the Chicago Architecture Foundation's River Cruise a few years ago. Marina City is a 1960s-era mixed-use residential and commercial complex well known for its distinctive "corn cob" 65-story towers that fascinated me when I took the tour. There's still plenty of time to see the Lego version at The Henry Ford in Dearborn, Michigan. The exhibit runs through February 24, 2013 and is included with museum admission. Want to learn more? Find out more about Lego and their history by checking out Lego: A Love Story by Jonathan Bender or The Cult of Lego by John Baichtal. 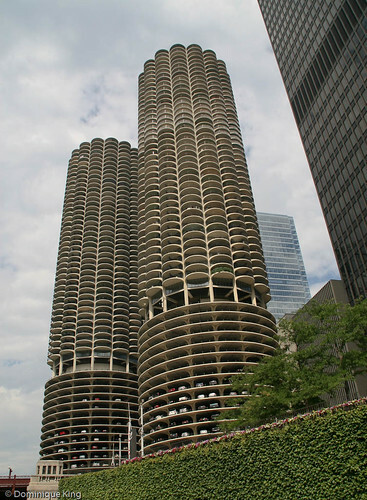 Learn more about the "corn cobs" by checking out Marina City: Bertrand Goldberg's Urban Vision, a book that's been on my Wish List for some time now. All that being said, perhaps I should go build my Lego kit of Frank Lloyd Wright's Fallingwater house!